As a Grand Isle native and former businessman, I’ve witnessed our coastal devastation firsthand. I’ve seen homes flood, productive fisheries disappear, hardworking citizens forced to change careers and move away, and industries relocate. I take this personally, and for me and my fellow citizens of coastal Louisiana, “doing nothing” is not an option. Since 1932, we’ve lost nearly 2,000 square miles of land and we stand to double that land loss over the next 50 years if we don’t take action. As the state’s leader of coastal protection, I go to work every day committed to bold actions needed to reverse the trend of land loss. The very future of Louisiana is at stake. Everyone needs to understand this isn’t just a Louisiana problem. Our coast supplies 90 percent of the nation’s outer continental oil and gas, 20 percent of the nation’s annual waterborne commerce, 26 percent of the continental U.S. commercial fisheries landings and winter habitat for five million migratory waterfowl — not to mention our unique culture and heritage that draw millions of visitors to Louisiana. The greatest results to change our future can be achieved by mimicking Mother Nature. We are seeing land gain in places where the river is still allowed to replenish our marshes and wetlands with fresh water and sediment, so we intend to do more of that by using controlled sediment diversions off the Mississippi River. Sediment diversions can restore the natural process that built our delta by reconnecting the river with its adjacent basins. These gated structures will capture and divert sediment, water and nutrients into the basins to build and sustain land. We will always keep studying and reviewing our data and results, but the time for action on these diversions has arrived. We wait longer at our own peril. The advancing Mid-Barataria and Mid-Breton sediment diversions are cornerstones of Louisiana’s Coastal Master Plan in the southeast and represent the largest coastal ecosystem restoration projects in the history of our country. These will be funded by money available from the criminal settlement of the 2010 Deepwater Horizon oil spill — not your tax dollars. Sediment diversions do not mean we’re giving up on dredging; we need to do both. Since 2007, CPRA has placed more than 130 million cubic yards of dredged material, including nearly 30 million cubic yards from the Mississippi River, benefiting more than 41,000 acres. Dredging is good, but sediment diversions are ultimately more sustainable and cost effective. However, we do need to do both, because we know they perform better and last longer when implemented in conjunction with each other. We’re committed to working with the federal government to streamline the permitting process without compromising its integrity, which is why, at the direction of Gov. John Bel Edwards, I recently signed a memorandum of understanding with several federal agencies, moving everyone toward the establishment of permitting timetables consistent with President Trump’s Executive Order No. 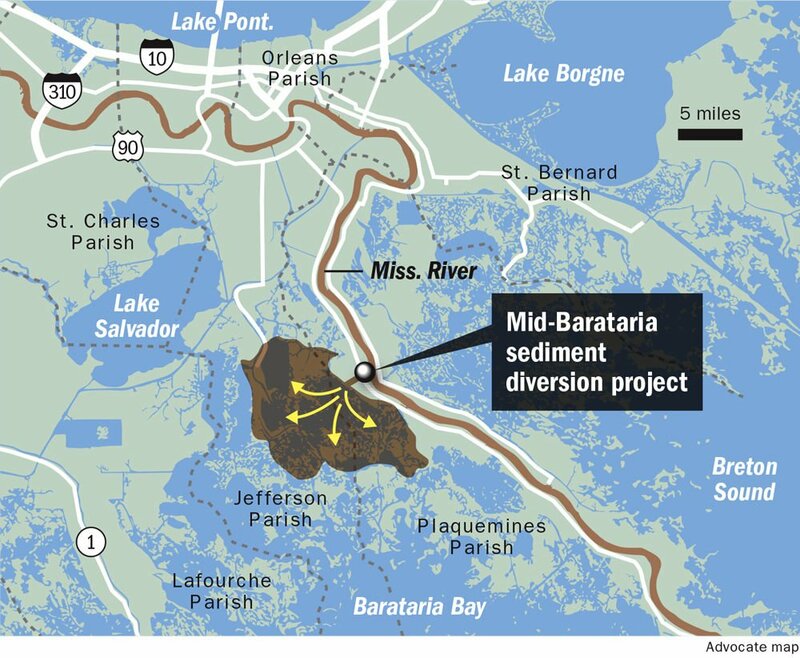 13807 that establishes discipline and accountability in the environmental review and authorization process for the Mid-Barataria Sediment Diversion project. After years of study, we are now committed to getting these diversions built as quickly and safely as possible. These vital projects will reduce risk from hurricane storm surge, help secure our nation’s vital infrastructure, boost the state’s economy, create jobs for Louisiana citizens, and preserve our one-of-a-kind culture. Let’s seize this opportunity, not only for ourselves but for future generations and work together to rebuild and maintain a place that is truly like nowhere else on the planet. Johnny Bradberry is executive assistant to Gov. John Bel Edwards for coastal activities and chairs the Coastal Protection and Restoration Authority.